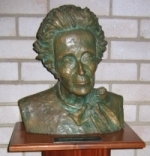 Founded in 1981 by the late Professor Elizabeth Sneddon, the EST has the proud reputation of being the first theatre to service a drama department at an academic institution. The theatre is now also available for hire by outside companies, and therefore hosts a wide variety of independently produced events, ranging from corporate functions and launches to dance programs, childrens' shows, music reviews, rock concerts, comedy, satire and drama. In addition, the Elizabeth Sneddon Theatre has a close association with the University's Centre for Creative Arts, playing host to such internationally reputed events as the Durban International Film Festival, Jomba! Contemporary Dance Experience, the Time of the Writer and Poetry Africa festivals. Nobody can say that nothing ever happens in Durban, for in one theatre alone there are over 17 productions of a varied nature taking place during the course of a year. Those that are privately funded by local entrepreneurs and producers are designed largely to entertain, as is necessary for financial feasibility. Festivals and events receiving sponsorship and funding from outside sources are structured not only to showcase and exchange ideas, artistry and talent but also to play a vital educational role. There are many people who work very hard at keeping theatre and the arts alive in KZN, and we encourage and implore the public to support events at all theatres and venues. We would also like to extend an invitation for comments and suggestions regarding productions for the future at the Elizabeth Sneddon Theatre. 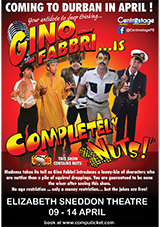 Having recently featured in Common and Class alongside Ian Von Memerty at the Elizabeth Sneddon in February, Gino Fabbri returns with his own music comedy `Completely Nuts`. `Sanity` is not a word very often associated with Fabbri, but this likeable and clean comedian will have you rolling in the aisles, as "madness takes its toll!"